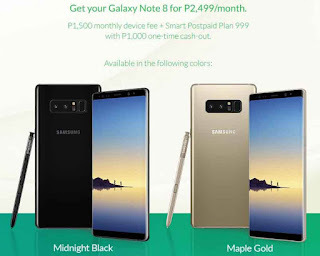 Smart Communications Inc. already posted their price for the new Samsung Galaxy Note 8 under postpaid plan. If you’re interested to get this device, you can apply or place your pre-order starting September 8 – 17, 2017 to get free AKG S30 Bluetooth speaker and one-month access to iFlix once your application is approved on the mentioned date. With regards to pricing, you get the Note 8 under postpaid plan 999 with PHP 1,500.00 device monthly fee and a one-time cash out of 1,000 pesos. Your base plan monthly bill will be Php2,499.00 under 30-month contract or lock-in period. You can choose from Plan 799 up to 2999 plus the respective monthly device fee that can be charged to the bill. For Plan 999, check out the inclusions as your reference. See table below for more plan price options. The Samsung Galaxy Note 8 is also available under All-in Plans and Giga Plans. You can submit your application online or visit the Smart store nearest you. For other queries and details you can call their hotline by dialing *888. Check out other plan details for Note 8 by visiting Smart Online store.